For the operation to check the installed firmware version of the AV Center. If the version is displayed as “1.12”, you do not need to update the firmware except Australia region. This time firmware version is 1.20. The difference between 1.12 and 1.20 is only upgrading of TomTom navigation feature for Australia region. The version 1.12 already has following 2 improved functions. So you don’t need to update from version 1.12 to 1.20 except Australia region. XAV-742 doesn’t have following 2 issues. But the update binary is common. So please replace from current firmware to this firmware. Note: The following issues are not occurred on XAV-742. Please make sure the PC is connected to internet. This firmware update is performed with a USB storage device to be inserted into your Car Audio unit. Make sure to use USB storage media with available space of 200 MB or more. You need to turn off and on the unit after the firmware update. The touch panel may not work if you skip this step. WARNING! Do not turn off the unit during the update process. Doing so may damage your unit and make it unusable, or may require service. Download the update file from the to your PC. 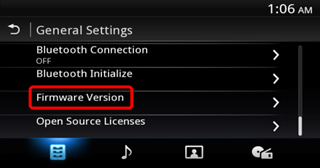 Extract the update file to create the "update" folder which includes SONYXAV.BIN. Copy the "update" folder to the root directory of the USB memory. This update procedure in your Car Audio will take approximately five minutes. Preparation: Park your car on the safe place and start the engine to avoid the voltage drop of the power line. Connect the USB storage media which includes the update folder to the unit. Any USB memory other than the one for update should not be connected. Press OFF button of the remote commander (or press and hold SOURCE button for 1 second ) so that the unit is in Source OFF state. Select Setting from Home Menu. Select General Settings → Firmware Version. Check if the current firmware is subject to update. 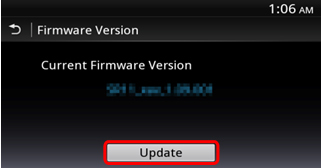 The firmware version 1.11 or earlier is subject to update. 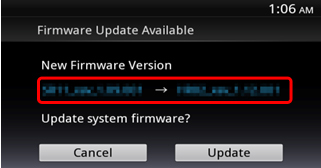 Press Update button again to start the firmware update. Important: Please wait until “Firmware Update Success! !” message appears on the screen without turning off the unit or removing the USB memory. Press and hold OFF button of the remote commander (or press and hold SOURCE button for 2 seconds) to turn off the unit. Remove the USB storage media and wait for more than 10 seconds. Note: Make sure to wait for more than 10 seconds so that the unit is surely turned off. Press SOURCE button to turn on the unit again. You need to update not only firmware but also map data files. Please refer a leaflet which is included into XA-NV300T to download and update the map data.